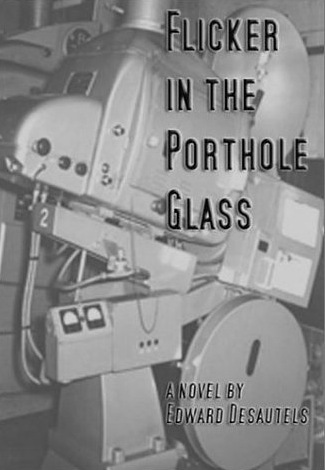 My novel Flicker in the Porthole Glass was published by MAMMOTH Books in 2002. The Review of Contemporary Fiction observed that, “…the achievement here is Desautels’s prose, an aural event both jagged and elegant, assaultive and inviting, that moves with the clipped, dangerous, urgent kinesis of hard bop jazz.” Seven years down the road, I’m going to publish Flicker here on Maximum Fiction in serial form. Today, I give you the first chapter of Part II, The Projection Booth: “The Machinery of Image.” Look for a new installment every Friday. Enjoy! And if you like what you see, please see my Flicker in the Porthole Glass page for information on ordering the MAMMOTH Books edition. Already the nail of my left forefinger is nearly white. Of course, as I go along, a corresponding amount of grease builds up beneath the nail of my right thumb which will later be removed by the nail of my left thumb under which the grease will remain until I can scrub it away with the brush in my apartment. I may, however, decide to pick at it with the pointed pocket clip on the cap of my ball-point pen. For a moment, I stop what I’m doing and hold my nails up to the light. There’s always a little grease the Boraxo fails to remove. Under the light, the damage: nails chipped; cuticles raw and chafed. The abrasive cleanser and the dry November air are eating my fingertips away. As I type, the projection equipment grinds so loudly I can barely hear the keys strike the page. This is, after all, the Olympia; not the Viking, not the Rittenhouse Forum, not the King of Prussia, the Cine Europa: those glory showpalaces given over to the slickly modern, the state of the art, the continuous-loop platter systems that have mechanized the projection booth and broken the back of the Motion Picture Operators Union. But, hunting and pecking in the Olympia’s din, my fingers do hammer, they are blackened with the grease that coats the guts of the Simplex 35 projectors, the grease that slicks the keys of my typewriter and which now charges my avocation with occasional hiccups: oily fingers glancing off the pads and lodging in the semiotic mesh of this old cast-iron Royal. A Quiet De Luxe, it is, banged together by a worker preoccupied with discovering the subconscious mechanism by virtue of which his recurring nightmare of The Battle of the Bulge accommodated the delicate gesture made every day by the newspaper guy he passed on Farmington Avenue, a beseeching and weary opening of the hand that so often wrecked the worker’s heart on those peculiar, pointillist afternoons so common during the Hartford rush hours of late August. 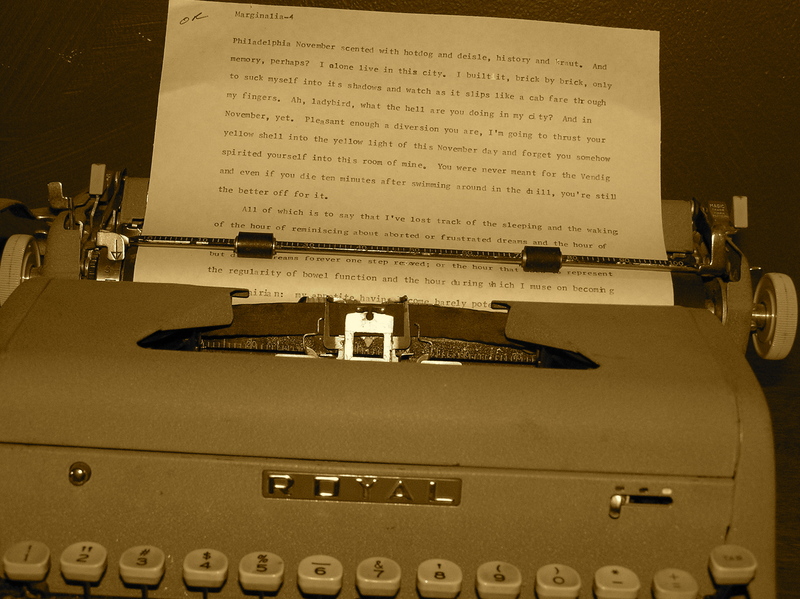 I stare at the keys and feel the iron dust in my lungs: the dust of Royal Typewriter, Hartford, Connecticut. And I daydream about all the other fingers that must have played over these keys—the long, slender manicured fingers of the winsome secretary who whispered “peanut” every time she broke a nail: the rudiments of a character searching me out, feeling me up. “Come on, baby. I’ll burn in your pages.” Out of something like curiosity, I hold the typewriter upside down and shake it the way a guitar player conjures a fumbled pick from the sound hole of his instrument. But nothing falls from between the keys; no fingernails, no iron shavings, no guitar picks. I read the last sentence over again to myself: The abrasive cleanser and the dry November air are eating my fingertips away. There’s no need to continue. That’s the secret: knowing when the story’s over. Tomorrow I’ll shove it in an envelope, fingerprints smudged over every page, but I won’t seal it. The guy at the post office will be petulant when I ask him to weigh my items and affix the proper postage to the self-addressed stamped envelope. He’ll run a sticky postal forefinger under his pimpled nose when I ask him to hold on a minute, just a minute, while I seal up the envelope containing not only the story, but the SASE, and he’ll blink twice when I ask that the thing be sent first class. At that moment, someone in the serpentine queue behind me will be jostled and mutter clever invectives under his sardine-flavored breath. A security guard will sneeze and the snot propelled from his nose will spatter his patent leather shoes. A young girl will say, “Bless you,” then look up at her mother as I pay for the postage with nickels, dimes, and pennies. The clerk will not be pleased. When I move away from the window, two men in pinstripe suits and matching fleurs de lis tie clasps will approach me and solicit money for Mt. St. Danny Thomas Hospital. Or it might just be the guy who gets himself up like Ben Franklin, and that other one, the guy set up on a milkcrate, sometimes at the corner of 11th and Market, sometimes at 5th and Chestnut, heaving labored breath through a Hohner harmonica and tapping a so-called rhythm with his spoons. Either way, I will look them in the eye and I will tell them: I know who you are and why you’re here and if I need Johnson & Johnson waxed, cinnamon-flavored dental floss I can get it and get it legal. These black marketeers will be the thorn in my side, tomorrow. Read all of installment II (PDF).